Who had the pleasure of working on a Marvel movie, probably knows that this studio is use to keep the creative process fluid until the very end of the show. Early decisions are kept open for changes and new directions are often taken, sometimes steering entire sequences of the film away from the original concept art. Guardians of the Galaxy was no exception. In fact, although many ideas stayed the same through out the development of the visual effects, other changed a few times. A good instance is the planet Morag which opens the film. The original concept art pictured it as a desertic and desolated landscape featured by gigantic pinnacles and humongous corals. My first involvement with the show, was for a trailer shot to be done in a couple of weeks time. 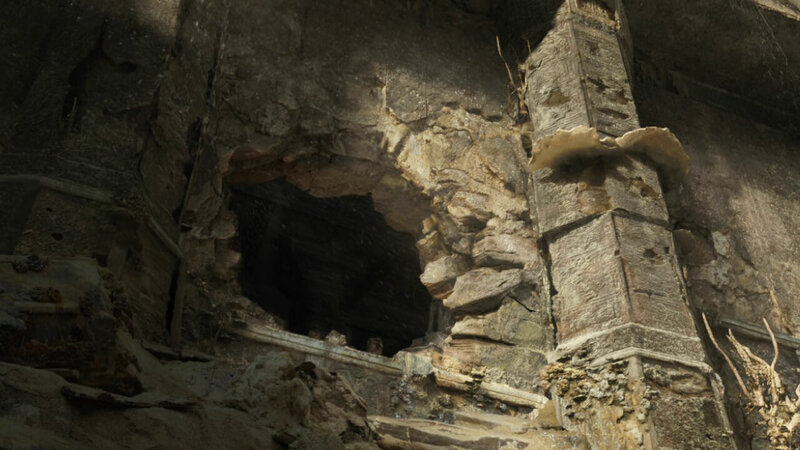 So, when I first started the matte painting I based it on the original brief. Unfortunately half way through the work I was communicated that the idea of the corals and the pinnacles was gone. There must have been a good reason for this decision to be taken. However, I believe that it might be worth to show where my work was before the sudden change in direction. Morag Planet // This artwork, somewhere between a concept and a DMP mock-up, shows the first ideas for this location. The image was done at a very high resolution to allow for the camera movement and it’s here presented raw and in its entirety, before 2.5 projection or compositing. The shot featured Peter Quill running away from the bad guys and jumping on his ship. The camera follows the main character and hence there is a pretty wide nodal pan going on. So, the whole background was built as a multi layered cyclo, reprojected onto geometry to allow for the necessary stereo parallax. 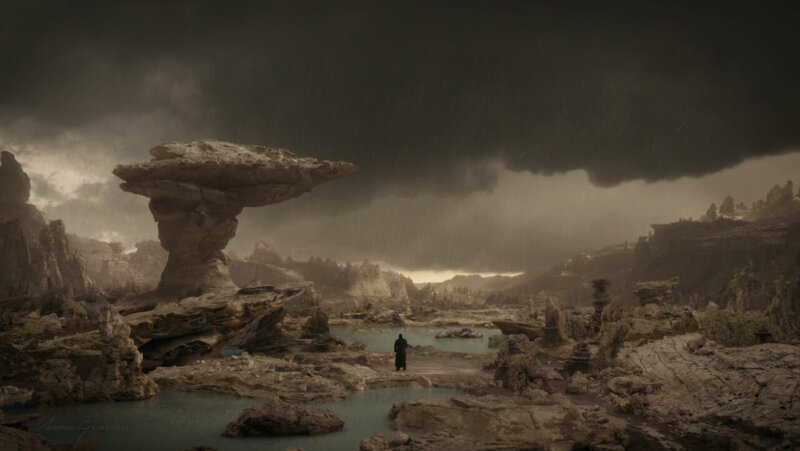 Morag Planet // Pre-compositing to present the DMP in the context of the shot, with rain, animated clouds and dynamic lighting. This was another shot to be done quickly for a temp delivery. The DMP was done in several layers, with two different lighting conditions (lit and unlit) for each one of them, to allow for some dramatic interactive lighting effects. Unfortunately, the whole sequence went through several changes and this shot was re-briefed and re-done from scratch a few times by Marko Ljubez at first and by Luca Bonatti later on, under the patient guidance of Thomas Mouraille and the always inspiring supervision of Marco Rolandi. I believe that in the end we had 4 or 5 completely different versions for this one. I had a good time working on the first one of these. So, I’m happy to show it here. Morag Landing // DMP precomp. Morag Landing // Personal compositing version. 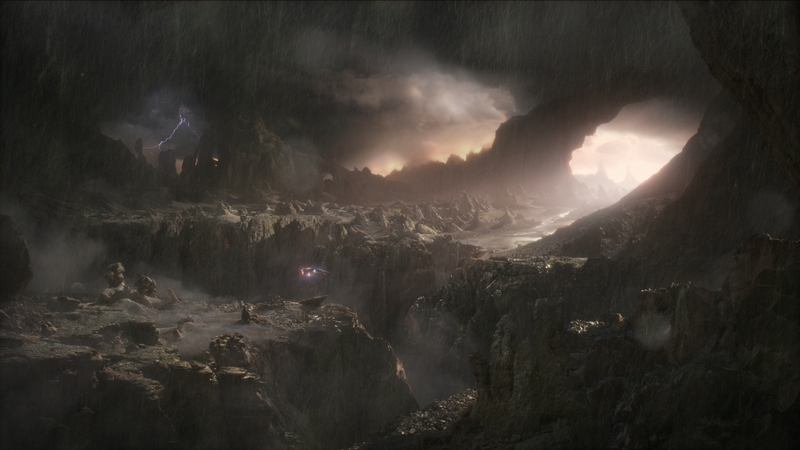 The Morag sequence is opened with this shot where Peter Quill’s ship lands on a canyon. This was the very last artwork I made for this project and weirdly enough when I was given the 3d layout to start working on it, I realised that some of the ideas discarded for the other shots in the sequence were approved for this one. So, I could finally play again with some humongous rocky structures to make the background more interesting! The whole DMP was created in layers and the original Layout geometry was readjusted according to the painting. So, that it could be used in Nuke for the projection. To conclude my job I was also adding movement to the clouds, smoke and mist elements, pushing the matte painting to a more polished look. I also had fun keep working on the compositing stage, including rain elements and lens effects into my own Nuke script, providing an alternate version of the final look of the shot. This differs slightly from the one made by MPC compositing department, which is the one included in the movie. Morag Temple // DMP precomp. Morag Temple // Final compositing version. 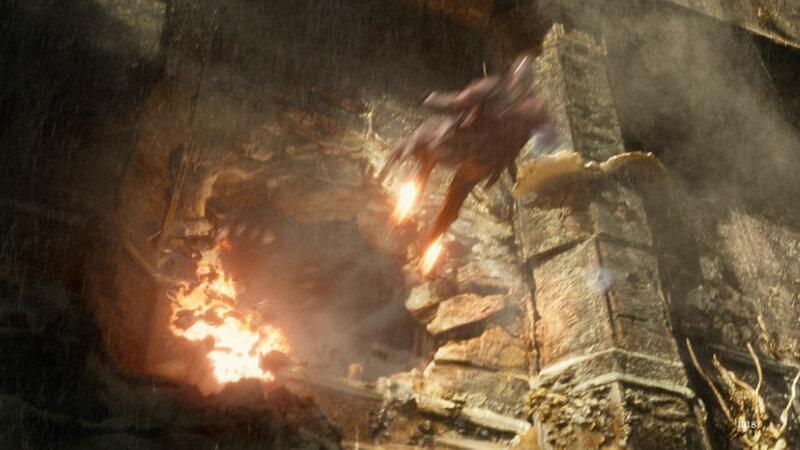 In this shot Peter Quill escapes the bad guys flying through a hole on the temple wall. In the final edit this is a very short shot, but we spent some time on it as it required interactive lighting and the camera movement had quite some parallax. The work started with Guillaume Renier using some Lidar scans of the set to mock up a layout. So, that when I jumped on the task, I had a clear understanding of what the supervisors wanted and within the space of a few days I managed to put together a pretty detailed DMP of the wall with all its ancient features. Once this was done I started modelling the whole structure and then I processed the DMP in Nuke to extract a good displacement map. Then, Tiziano Fioriti assisted me setting up multi layered renders in Vray. So, that I could recombine and project all these components together with the DMP in Nuke, introducing the camera movement and simulating the interactive lighting coming from the flames. As a final touch I added some water dripping from the top cornice, together with smoke and dust elements, just before delivering everything to the compositing department.